Red Jasper shields you from negativity by deflecting blame and judgment that is being sent to you by others. It holds the charge of a “fiery lion,” representing the consciousness of sovereignty. 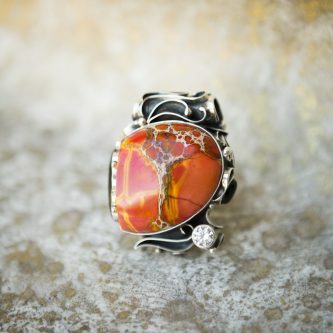 This stone holds Earth and Fire elements, generating a “firewall” around you. It stops the interference of others in your affairs. Physically, it supports vitality, strength, and health. Because it is a blood-activator, it adds life force into the blood, heals capillaries, arteries, and vein injuries, and improves circulation.